I’m trying to use [http://cdmqueries.omop.org/home](http://omop queries.org) with PostgreSQL. I know it’s for Oracle and Redshift, so it’s different with others. Some queries work, some queries don’t work. what is source_vocabulary_id, and target_vocabulary_id and where are those from? Does this query even work on Oracle? ‘Source_vocabulary_id = 2 / Target_vocabulary_id = 1’?? I don’t understand it. It seems like the original link was http://cdmqueries.omop.org/condition-era/ce07 ? Querry in question appears to be written for CDM v4. That would explain integer values for source_vocabulary_id and target_vocabulary_id and fields. CDM v5 uses varchar for all vocabulary_id keys across all tables. 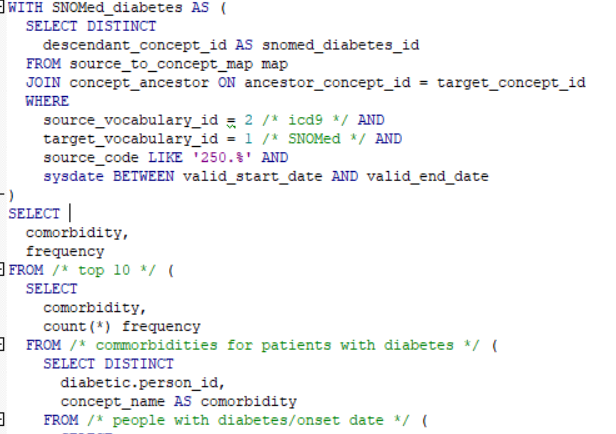 Currently vocabulary_id value for ICD9 (american clinical modification) is ‘ICD9CM’, and ‘SNOMED’ for SNOMED CT.